i loved how comfy it was you couldn’t tell it was an air b and b there was plates, bowls, forks, knives, pots, pans, lotion, soap, towels, sheets, and an ac and even more!! the staff was friendly and didn’t hover. it was close to a lot of food places a 99 cent store supermarkets and stuff. it was like a home away from home !! That it was quiet and felt like home. Comfortable, clean and the bed was very comfortable and the premises was very clean. Richard was very nice and funny, not stiff like some places you go to stay. Friendly ! I loved that there was a corner store close to the house. Apt was spacious. Nice temperature. A.c. worked well. Good water temperature. Quiet and calm. The Transportation and stores are very close to the property. Lock in a great price for Studio and 1 Bedroom Apartments - Bronx – rated 8.1 by recent guests! 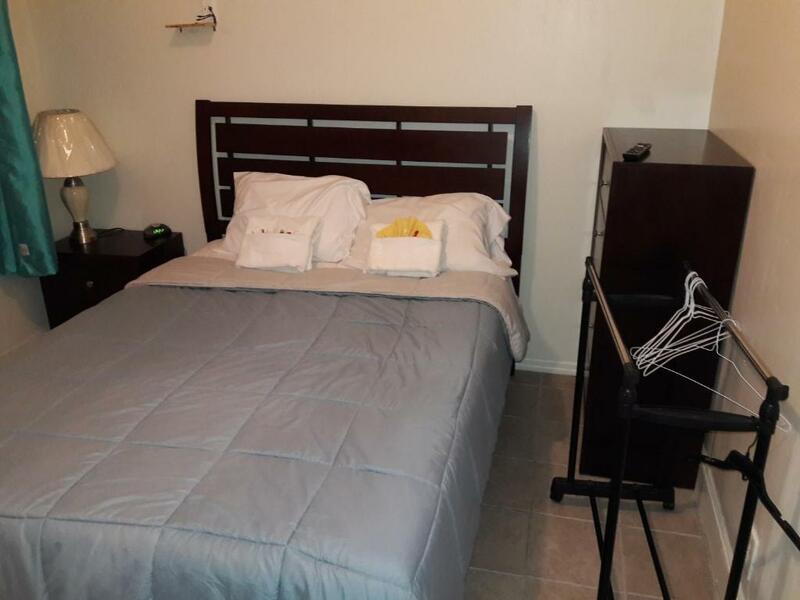 Studio and 1 Bedroom Apartments - Bronx This rating is a reflection of how the property compares to the industry standard when it comes to price, facilities and services available. It's based on a self-evaluation by the property. Use this rating to help choose your stay! One of our best sellers in Bronx! Located in Bronx, Studio Apartment, Bronx, NY offers self-catering accommodations with free WiFi. The apartment is 3.1 mi from Bronx Zoo. The kitchenette comes with a microwave, fridge and blender. A private bathroom with free toiletries and a hairdryer is also available. The apartment is equipped with a flat-screen TV with cable channels and DVD player. New York Botanical Garden is 3.7 mi from Studio Apartment, Bronx, NY, while I Am Park is 1,650 feet away. The Yankee Stadium and LaGuardia Airport is 3.1 mi from the property. 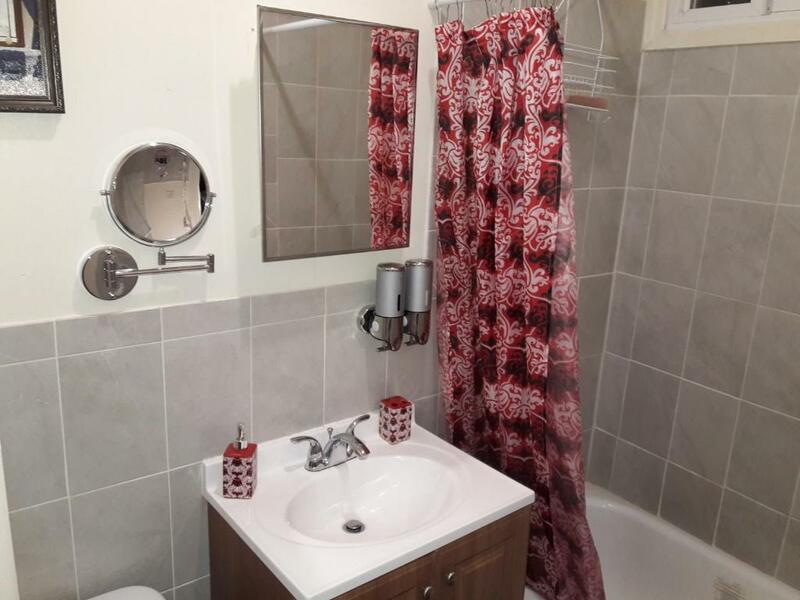 This property also has one of the top-rated locations in Bronx! Guests are happier about it compared to other properties in the area. This property is also rated for the best value in Bronx! Guests are getting more for their money when compared to other properties in this city. 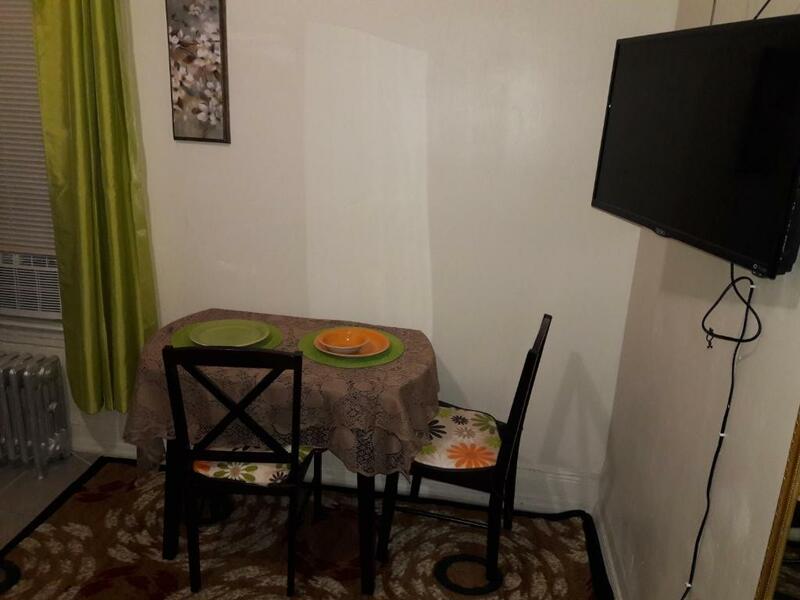 When would you like to stay at Studio and 1 Bedroom Apartments - Bronx? This apartment has a sofa and air conditioning. Please note that the extra bed that can be provided in the apartment will be a sofa bed. Please note that the extra bed that can be provided in the apartment will be a sofa bed. What makes the property special is that it's 100% private. .No need to share bathroom or kitchen. ...Its 30 minutes to midtown. ..60 minutes to the statue of liberty and Ellis Island. ....Quiet and comfortable place to rest your head. I am an entrepreneur and love what I do... I love to greet people and make them comfortable. ...My interest are swimming, photography, fishing and biking. House Rules Studio and 1 Bedroom Apartments - Bronx takes special requests – add in the next step! A USD50 damage deposit is required 7 days before arrival. This deposit will be fully refunded 7 days after check-out, as long as there isn't any damage to the property. Any additional children or adults are charged USD 39 per night for extra beds. Studio and 1 Bedroom Apartments - Bronx accepts these cards and reserves the right to temporarily hold an amount prior to arrival. Guests checking in after 20:00 must do self check-in. The property will require a copy the the guest's photo ID and copy of their credit card sent via phone text. An electronically signed form will also be required prior to arrival. Please contact the property for details. Please note that the property will contact you after the reservation is made for credit card pre-authorization and with other payment related information. Please note, the credit card using to make the reservation must be presented at check-in and must be in the name of the guest checking-in. A damage deposit of USD 50 is required. The host charges this 7 days before arrival. This will be collected by credit card. You should be reimbursed within 7 days of check-out. Your deposit will be refunded in full by credit card, subject to an inspection of the property. Please inform Studio and 1 Bedroom Apartments - Bronx of your expected arrival time in advance. You can use the Special Requests box when booking, or contact the property directly using the contact details in your confirmation. The line of communication can be improve a lot in order to be in touch with the management whenever needed during reasonable time the day. All the codes on the doors but it wasn't that bad, I got used to it. The TV's need to be updated. The house wasn’t really worth the amount, we ran out of toilet paper and everything was so close together and clustered, also the oven smelled like it was leaking gas. Water pressure in shower was low.